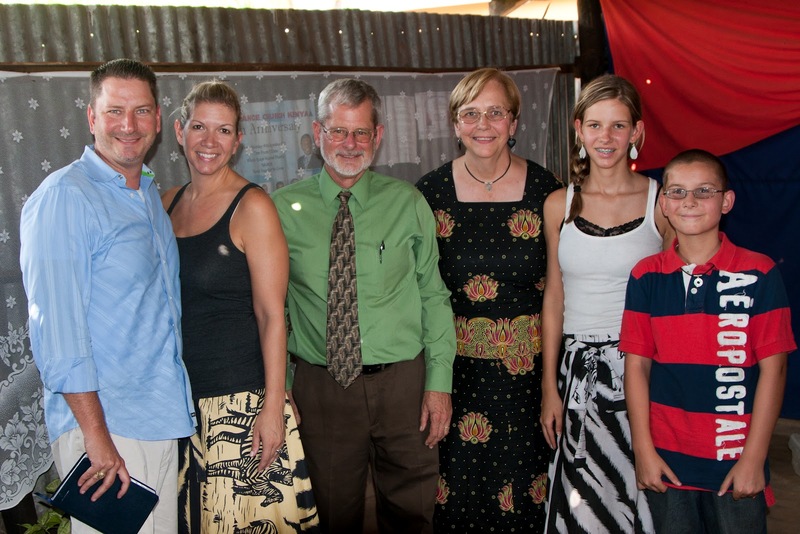 In November of last year (2011) Don met with these two pastors from Ukambani who we had known for many years. They told us people in their community were starving. We felt God wanted us to help. We shared our concern for the hungry on Facebook. A friend in France saw the post and donated the amount we gave the pastors! That meeting changed the course of our ministry. When we returned to Kenya in April of 2012 these two pastors told us stories about how they had both used the food (corn and beans) to share the love of Christ with the poorest in their villages. Not only did they bless those in their churches; they blessed the unbelievers as well. More than one person accepted Christ. The food changed lives for eternity. We have seen both these pastors give to others in their community and encourage their members to give. We have preached in their churches and have packed out the buildings. We now want to bless their congregations by putting a roof on their buildings. The iron sheets will waterproof their churches. They built the walls with hand made bricks, held fund raisers and personally gave sacrificially to build a place of worship for their growing congregations. We wanted to give our friends and family the opportunity to join us in this project. The people of these two villages have worked hard to build their churches in an area that struggles with lack of food and water. They have done what they can; and more. We want to help top it off. We estimate that it will cost $1,500 US to roof both churches. If you would like to join us you can donate to Burning Plow Ministries at www.burningplow.org or via mail at PO Box 642, Lancaster, TX 75146. Thanks for reading this and as God leads, giving to bless those who are blessing others. Gee, I can't believe I have not posted anything since July 1st. Time has really flown! The highlight of July was our family came to see us!!! Our son Rob, Stacy, Maddie and Cody arrived July 27th. They came to see the work and minister with us. 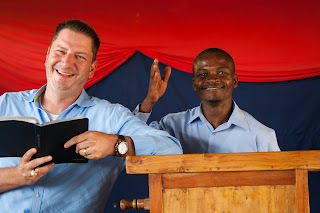 They ministered in Kibwezi, Namelok, Kawaida and Nairobi. Stacy read the story of Noah to the children in Kibwezi. The entire family helped with the craft. 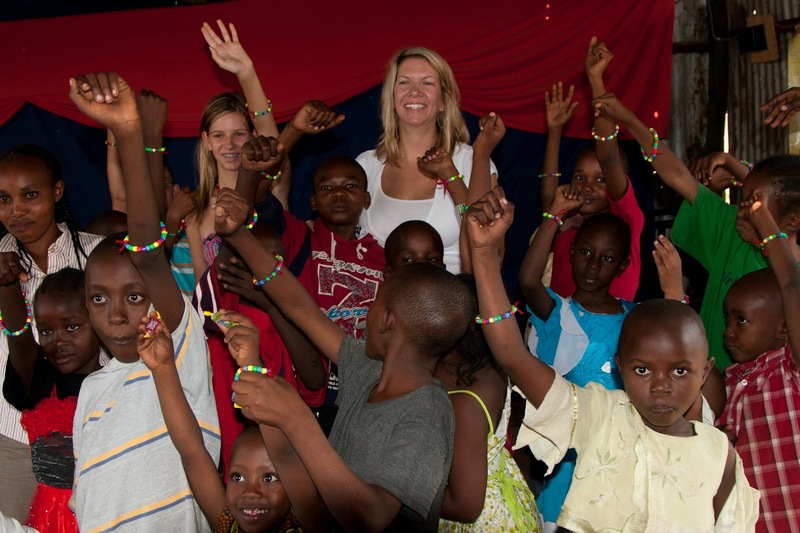 They made bracelets to remind them of God's promise of the rainbow. 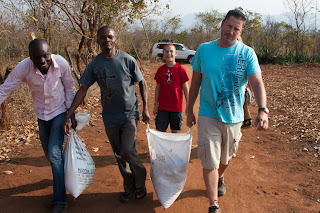 Rob and Cody helped deliver food to a very needy family who we met last year. Silas and Pastor Shadrack went with us. 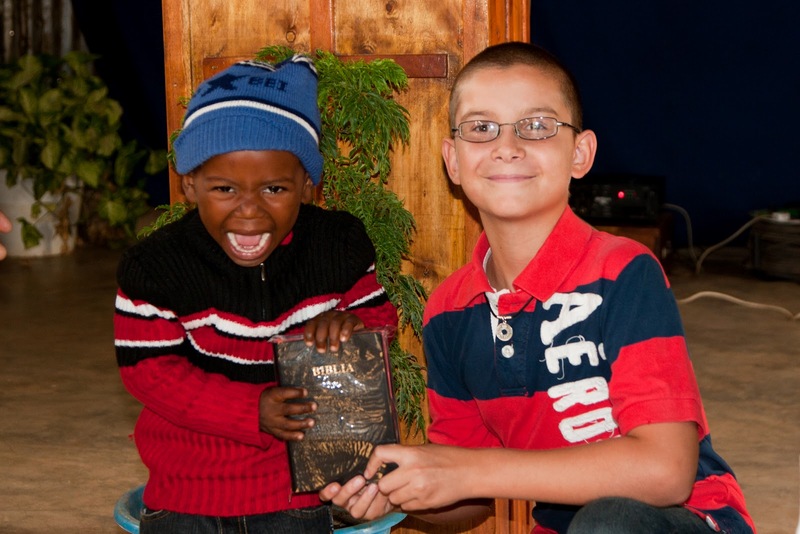 Cody and Maddie helped give out Bibles to the Saturday Children's Bible Class. This little boy was so exacted! He was the last one to get a Bible that day! Rob preached his first sermon on God's grace. We are so proud of him and his desire to share his faith. The school children in Namelok welcomed Cody and Maddie. They were very excited to have visitors. 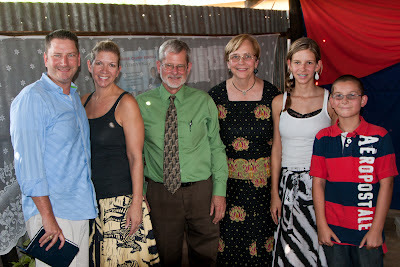 As you can imagine we are thrilled that our family came and actually participated in the work God has given us. We would welcome others to come and see first-hand what God is doing through Burning Plow Ministries. I will be posting more in a few days! God has truly given us many opportunities. We appreciate your prayers and participation!